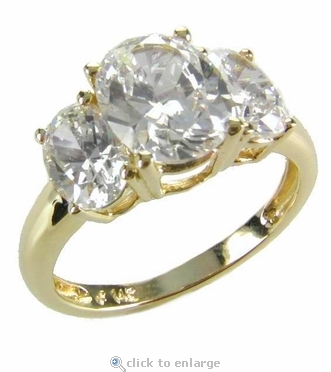 Our Venta Three Stone 1.5 Carat Cubic Zirconia Oval Anniversary Ring features three individually basket set ovals. 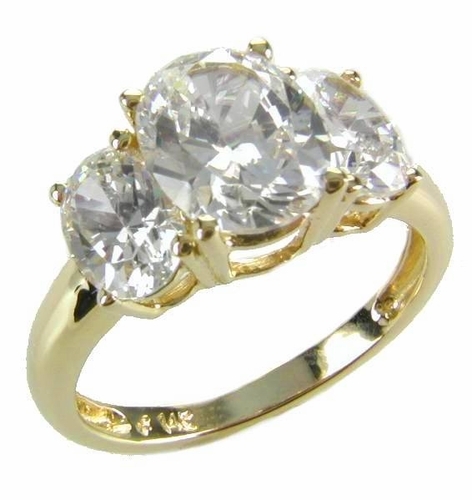 This three stone oval anniversary ring includes a 1.50 carat 9x7mm oval center with .75 carat 7x5mm oval side stones. The elongated oval shape cubic zirconia tend to make your fingers look longer with 58 facets to show off their brilliance. The total carat weight of this anniversary ring is 3 carats of the finest diamond simulants available. Shown here available in 14k white gold and 14k yellow gold but you can have this ring custom made in 18k gold or Platinum. You can also special order this three stone oval ring with your choice of color center stone. 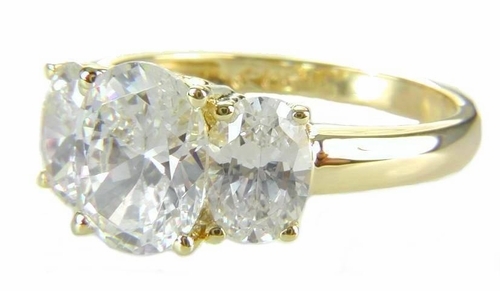 Simply call us for a quote or live chat with one of our cubic zirconia jewelry specialists. Due to the extremely low prices, all clearance sales are final.